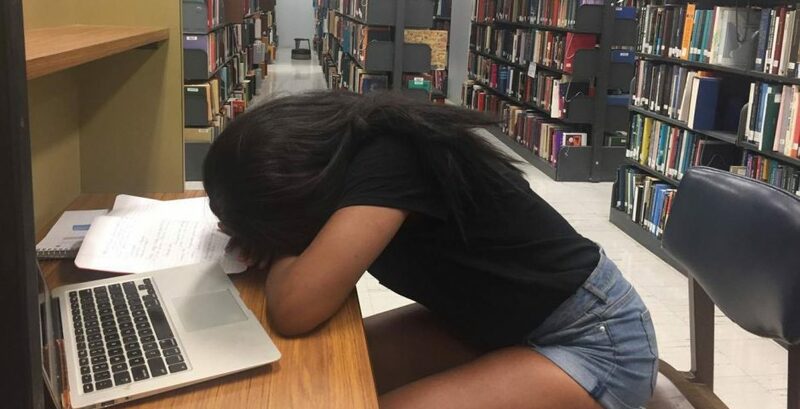 Animal Science is one of the most sleep-deprived majors in America, according to a new survey, as they sleep just 4.9 hours per night. And notoriously tough majors like Architecture, Biochemistry and Engineering all sleep around just six hours on average. Over 40 percent of students said they feel tired in class every day, and 28 percent reported feeling tired three to five times a week. Just three percent said they rarely ever feel tired in class. See where your major ranks below – the data comes from a survey of over 1200 students across the US who self-reported their sleeping habits. These findings come as no surprise to researchers campaigning to ban early morning classes who say if students consistently can't get enough sleep, they find it way harder to study. "That's when you start to see small decrements in performance," explains Dr Michael Breus, a sleep specialist in Los Angeles who spoke to The Tab about our findings. "Your reading comprehension will start to slow down and your ability to remember facts. You may even see grade point differences between early morning classes and late afternoon classes." He also called for colleges to scrap 8ams for health reasons. "There's no question they should be banned, removed, never to be seen again." No shock that 77 percent of students said they would like to see 8ams outlawed. "College kids sleep like crap," Breus adds. "Honestly, it's kind of a miracle you found any college kids who are getting seven hours of sleep."